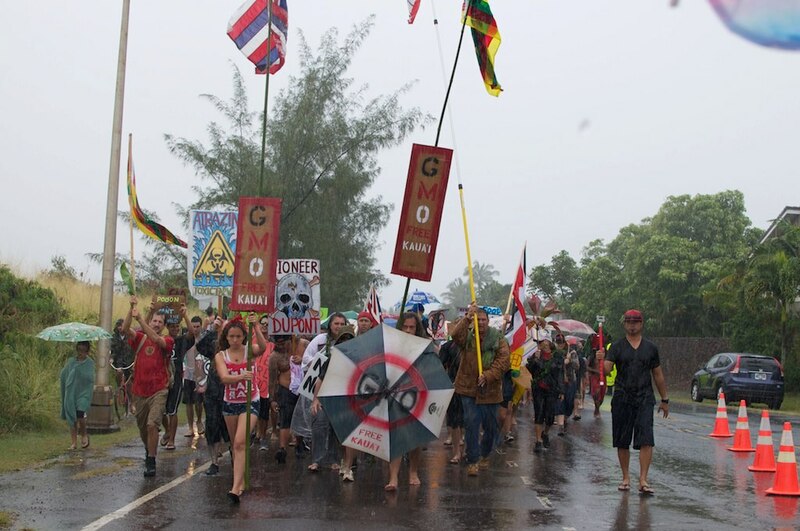 On Saturday, March 9, 2013, thousands of activists on the Hawaiian island of Kauai Marched to Evict Monsanto. 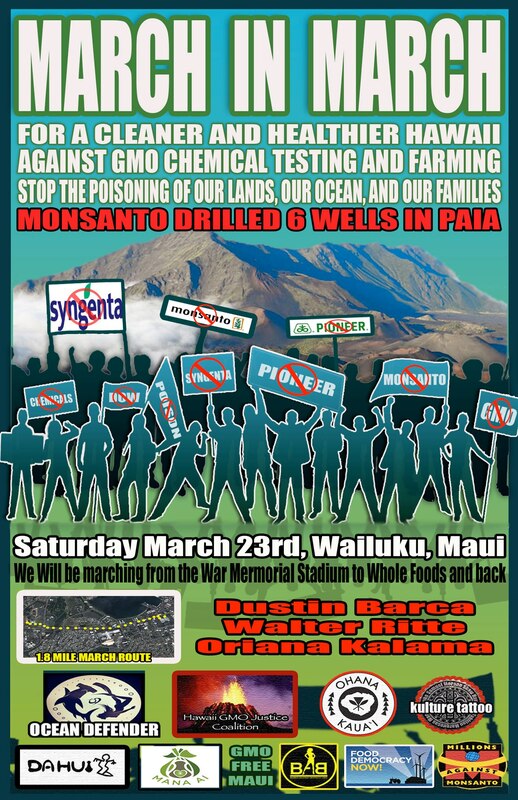 For the last 20 years Hawai’i has been the global center for open-field testing of genetically modified crops and the people have had enough! 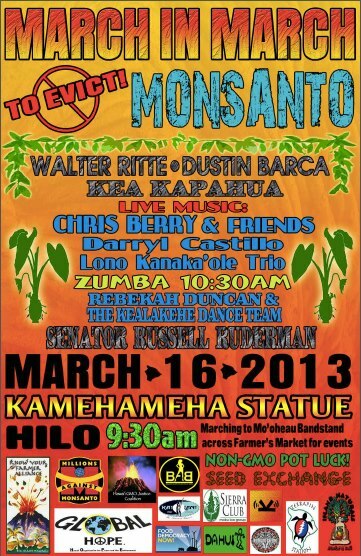 Next week’s March in March to Evict Monsanto is in Hilo on the Big Island. 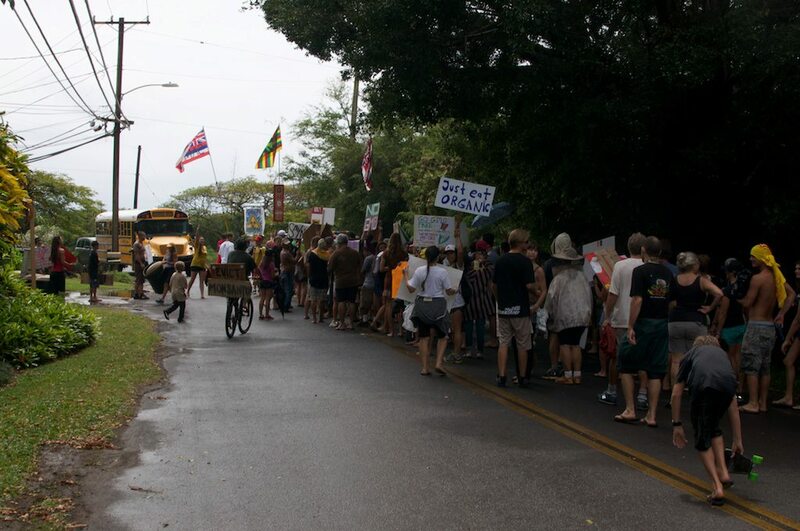 HALEIWA, OAHU (HawaiiNewsNow) -Hawaii’s anti-GMO movement made its latest stop in Haleiwa. Hundreds poured onto Kamehameha Highway to protest one of the state’s largest producers of genetically modified crops: Monsanto Corp.
Organizers, who plan similar rallies around the state this month, said chemicals used on genetically modified crops are harming residents. They are calling for better labeling of GMO food products — if not an outright bans. “We are worried about our health, we are worried about the health of our land and our island,” said Molokai activist Walter Ritte. “We’re looking at a lot of problems with the seeds, we’re looking at a lot of problems with the poison sprays that are on them,” he said. 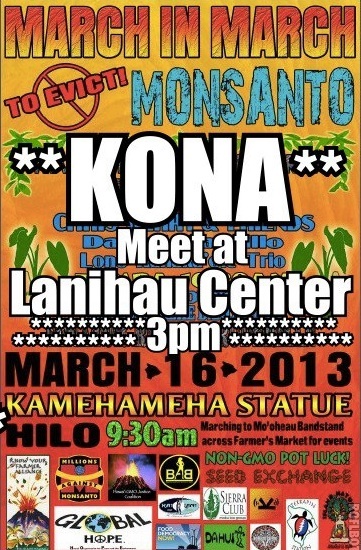 Many of Hawaii’s largest agribusinesses grow GMO crops. They say a ban or labeling will hurt the economy. “The seed industry is a $250 million a year industry that supports 2,000 local jobs. 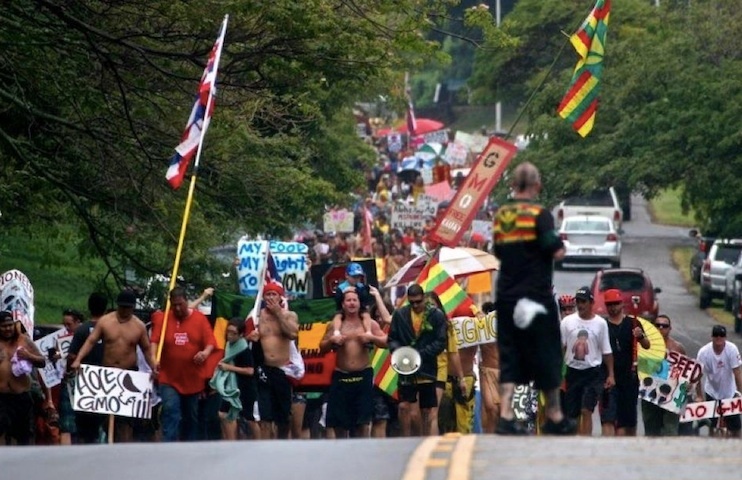 and these people are rallying to put 2,000 people on the state’s unemployment roll,” said Alicia Maluafiti, executive director of the Hawaii Crop Improvement Association. 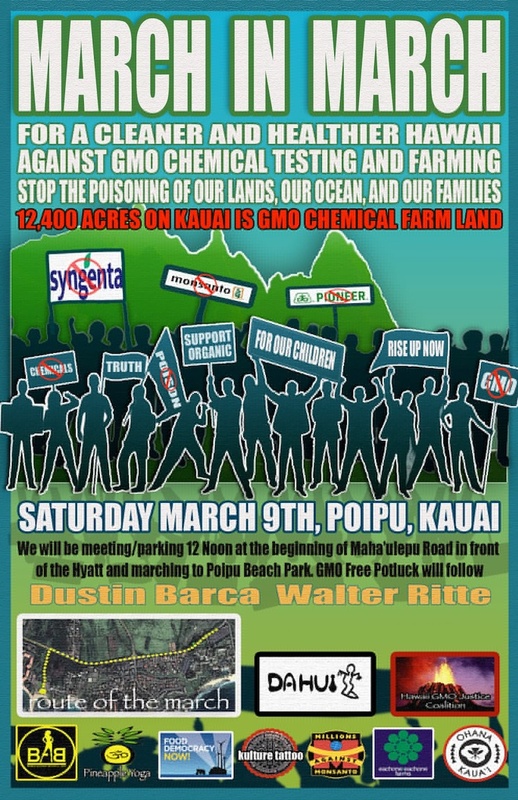 Maluafiti says the health risks associated with GMOs are way overblown. “We’ve had almost 20 years of genetically engineered food. We’ve had 3 trillion servings — and not one single case of health or safety risk,” she said. The state Legislature is considering several bills to regulate GMOs. 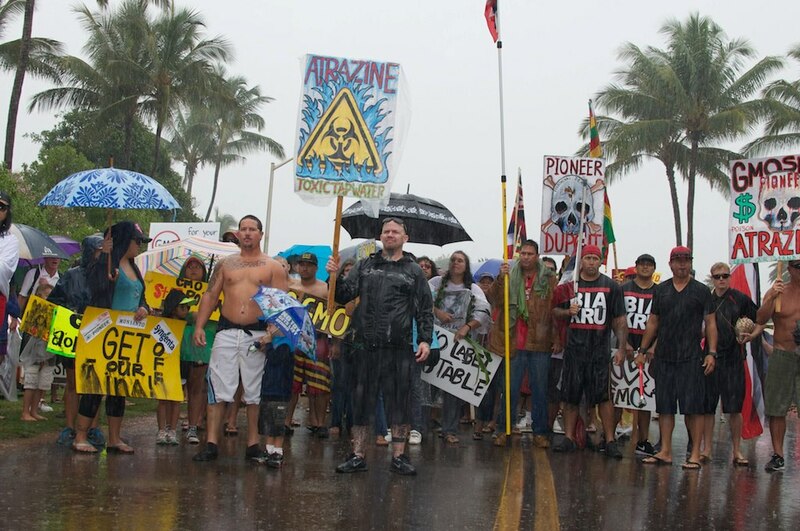 In the meantime, protesters say they will continue to take their anti-GMO message to Hawaii’s streets. 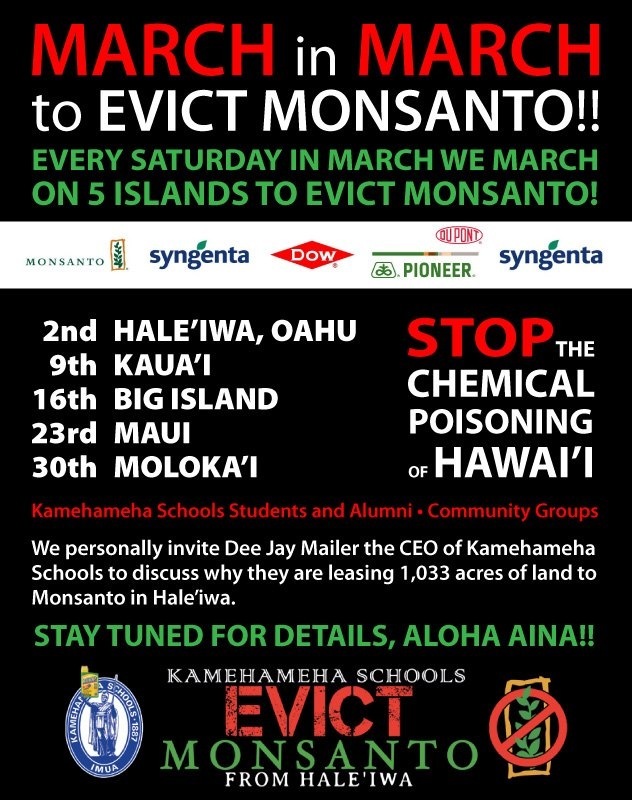 On every Saturday during the month of March safe food activists throughout the state of Hawaii will be marching on 5 of the major islands to evict Monsanto. 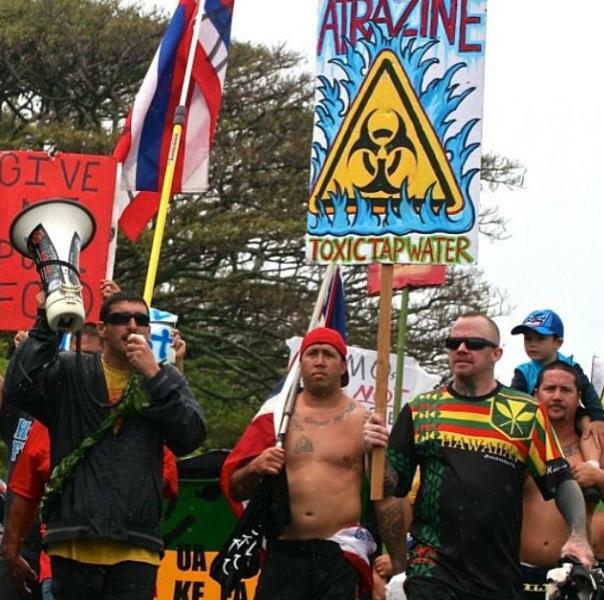 STOP the Chemical Poisoning of Hawai’i! Environmental attorney Andrew Kimbrell shared Berry’s quotation with a standing room only crowd on the final evening of the Hawai‘i SEED Tour event featuring Dr. Vandana Shiva Thursday at the Kaua‘i War Memorial Auditorium (see Saturday’s online edition for a full story about Shiva’s presentation). Opening the event for Dr. Shiva Thursday night were Kimbrell and Hawaiian activist Walter Ritte. In introducing Ritte, emcee Nancy Redfeather of Hawai‘i noted his work in 1975 reclaiming Kaho‘olawe from the U.S. military, which was using it for target practice. She also recalled watching him and his two sons testify to stop a company from doing biological drug testing in Hawai‘i and how they successfully blocked the effort. He said some islands have lost one of those economies and people get by on a cash economy. For him, the answer boils down to food sustainability. “If we are not going to learn how to feed ourselves, we are never going to be independent, self-sufficient and sovereign, never. Never,” he said. Ritte described having the doors shut on protesters last year during an anti-GMO rally at the State Capitol. He said his job for the evening was to instill in the audience the idea that talk alone would not solve problems. “If we don’t do anything, we are going to lose. We need you to participate in government,” Ritte said. 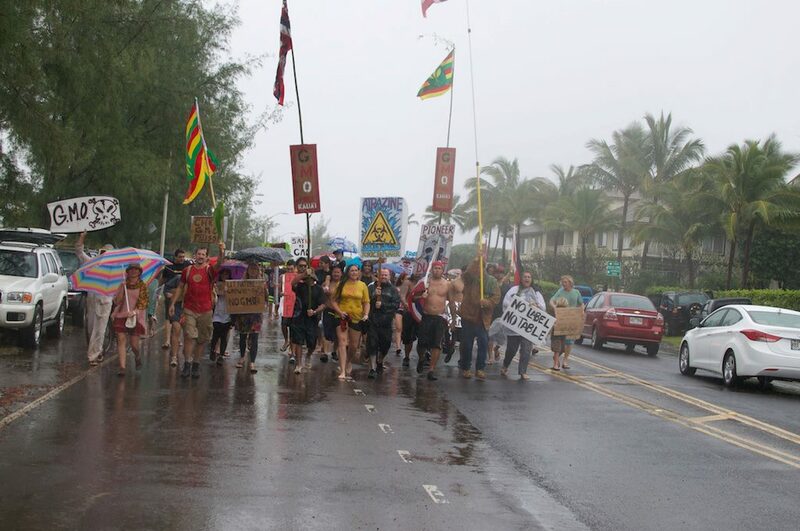 He praised the efforts of the Hawai‘i SEED leadership in getting people involved on both leading a three-mile march from UH to the Capitol on O‘ahu and in filling the entire facility on Kaua‘i. Ritte also addressed the issue of the Public Land Development Corporation, calling on Gary Hooser to take the lead on making changes. With the changes in House leadership, Ritte said the doors are open to affecting change statewide. 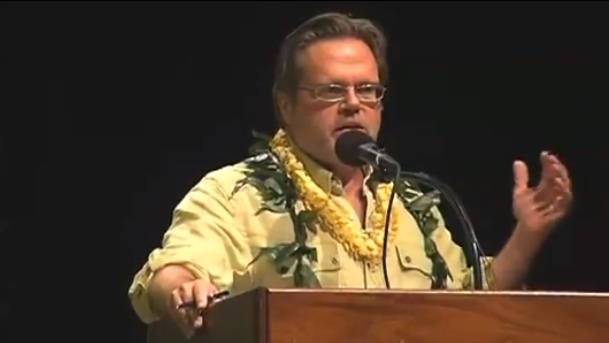 Ritte said yesterday marked the 120th anniversary of the overthrow of the Hawaiian monarchy. He said the issue needs to be made pono, to be corrected in order to move forward. “If you build the foundation of how we’re going to protect our environment, using the most powerful laws in the state, it’s not going to be just the Hawaiians rising up. It’s going to be all of us joining up and rising up together because of the love we have for future generations,” he said. Along with Shiva was Andrew Kimbrell, who became the executive director of the International Center for Technology Assessment in 1994 and the executive director of the Center for Food Safety in 1997. As one of the leading environmental attorneys in the nation, he has authored several books on the environment, technology in society and food issues. In 1994, Utne Reader named him as one of the world’s leading visionaries. Kimbrell opened his talk by paying homage to emcee Nancy Redfeather and her work in the legislature and to Jeri Di Pietro, president of Hawai‘i SEED. The next thing Kimbrell knew, Ritte and his Hawaiian warriors chained themselves to a building where the Regents for the University of Hawai‘i was meeting to give up the patents they had on taro, which ultimately they did. Kimbrell said he met Dr. Vandana Shiva in 1989 at the first global warming conference for NGOs. He said the “beauty and nobility of her presence” immediately drew him to her. Kimbrell fired off a long list of products his group has stopped, including the Flavor Savor genetically engineered tomato to wheat, alfalfa, sugar beets, slo mo grass, rice, even biopharmaceuticals. He described writing Proposition 37 in California, and how they lost the proposition 51 to 49. He said Monsanto spent $50 million and only won by a narrow margin. He noted there are five major companies equal to Monsanto including Dow Chemical, DuPont, Syngenta and Bayer. The crowd loudly tried to correct him, shouting out “Pioneer!” to which Kimbrell reminded them that Pioneer is a subsidiary of DuPont. Monsanto, DuPont and Syngenta own 51 percent of the world’s seeds, he said. The seeds are designed to withstand huge applications of pesticides, which the same companies sell, Kimbrell said. He said the Big 5 put out 115 million more pounds of pesticides and “we get rid of 40 million pounds of pesticides,” but it creates an adaptation of super weeds through survival of the fittest and weeds that can’t be killed with RoundUp. Dow Chemicals said took over and created 2,4-D resistant crops. “2,4-D is one of the elements in Agent Orange. 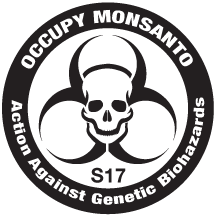 So then they start a chemical arms race because Monsanto says they are going to go with Dicamba,” Kimbrell said, adding that these crops are currently up for USDA approval. He went on to say “one of the most troubling things for me” is that the FDA is currently finalizing the approval of genetically engineered salmon. “The salmon was originally engineered with human growth genes to make it grow larger, faster, and now they put some pout genes to do the same thing,” Kimbrell said. He added that researchers said it would take a very small number of these salmon to decimate all salmon. “Sixty fish like this, if they are released into a population of 60,000 native salmon, can cause extinction in thirty generations,” Kimbrell said. He said there are about 45 days left for people to contact the FDA and tell them not to approve the fish. Kimbrell added that 1.25 million people so far have signed a labeling petition asking President Obama to label GMO foods and said it is the largest response the FDA has ever had. Based on the passion shown for the petition, Kimbrell encouraged the audience to have passion for their convictions. “The U.N. just came out with a report that said the way we are going to feed the world is not through genetic engineering, is not through toxic inputs, is not through pesticides, is not through the 2,4-D and the Dicamba and the RoundUp that is in the dust on Moloka‘i and hurting and killing children on this island. We know it’s the toxic herbicides. That is not progress. That can never be progress,” Kimbrell said, adding the companies are destroying the Earth and making “zillions of dollars” in the process, all in the name of progress. “We’ll occupy progress,” he said. Kimbrell encouraged the audience to be creators by getting involved to no longer be part of the desecration as described by Wendell Berry. “Don’t just read a poem, write a poem. Don’t just listen to music, write music. Don’t just eat food, grow food. That’s the way to do it. Don’t just watch romantic movies, make love,” he said. In the end, he encouraged the crowd to come together in the food movement. LIHU‘E — The Kaua‘i War Memorial Convention Hall was standing room only as more than 1,100 people showed up Thursday night to hear a presentation by environmentalist Dr. Vandana Shiva. “Your island is truth speaking to the world,” Shiva told the crowd to thunderous applause. Joining Shiva as part of a three-day Hawai‘i SEED Tour was environmental attorney Andrew Kimbrell and Hawaiian rights activist Walter Ritte of Moloka‘i. “Dr. Shiva is like the Dalai Lama of Agriculture,” Ritte said of the Indian philosopher, physicist, environmental activist and eco-feminist who has authored more than 20 books. As a leader in the International Forum of Globalization, Shiva fights for changes in the practices and paradigms of food, according to her biography. Shiva met with residents of the Westside for dinner ahead of time to discuss a pending class action lawsuit over the continued experimental use of pesticides by biotech companies in the area. 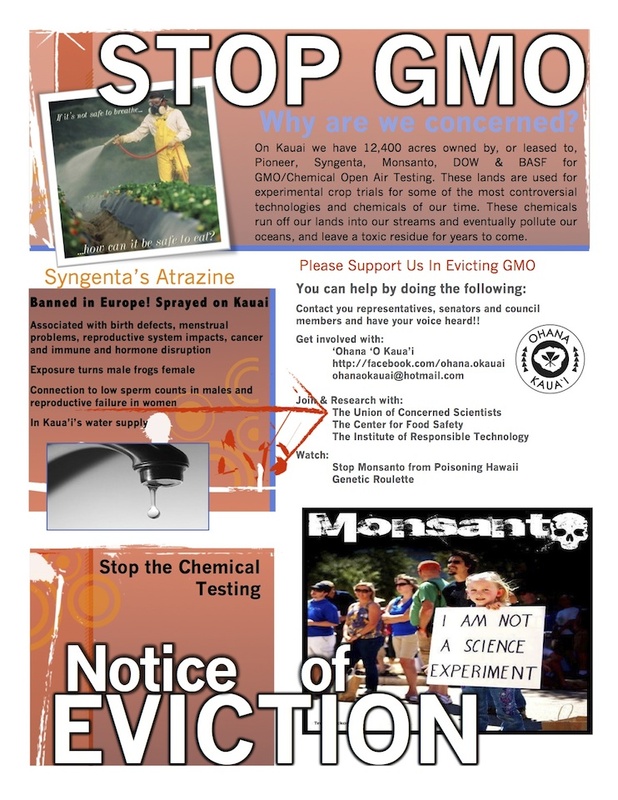 Because of the experiments taking place with pesticides and genetically engineered seeds on the Westside of the island, Kaua‘i is considered ground zero internationally in the fight to stop biotech companies such as Monsanto, Dow, DuPont, Bayer and Syngenta from creating more products and patenting more seeds. 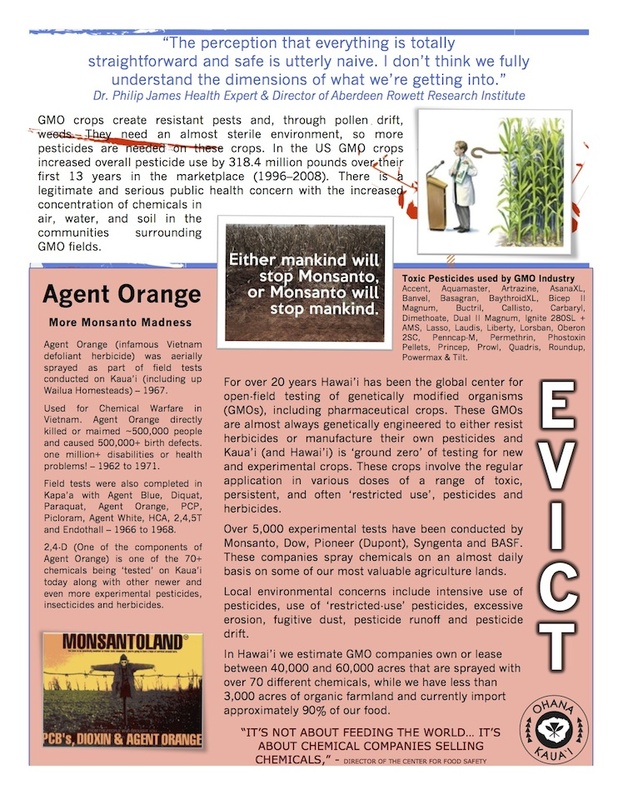 Organizers are also working to have Hawai‘i become the first state to label foods containing genetically modified organisms. In assisting grassroots organizations in the green movement worldwide, Shiva has been featured in several documentaries and received the Right Livelihood Award and the Global 500 Award of the United Nations Environmental Program. She has been called one of the five most powerful women in Asia. Sponsored by Hawai‘i SEED, The Center for Food Safety and Navdanya, the evening discussing the elimination of genetically modified organisms, along with the labeling of GMO products, was the culmination of a three-day long Hawai‘i SEED Tour that had Shiva, Kimbrell and Ritte speaking to a sold out audiences at the University of Hawai‘i at Manoa and at the Kapolei Salvation Army Ray Kroc Center, along with legislative briefings and presentations in the State Capitol by Kaua‘i County Councilman Gary Hooser, Sen. Laura Thielen and others. At the outset of the evening, vendors from around the island set up a seed giveaway featuring a local farming resource fair and silent auction to benefit Hawai‘i SEED. Emceeing the Kaua‘i event was Nancy Redfeather of Kawanui Farm on the Big Island, who in her work as a teacher and gardener has helped create 65 school gardens through her work as program director for the Hawai‘i Island School Garden Network and is the director of the Hawai‘i Public Seed Initiative. Opening the evening at the Kaua‘i War Memorial were students from Kanu I Ka Pono New Century Public Charter School, who greeted the audience with chant and poetry. “There’s room for man’s need, but not man’s greed,” said one Kanu I Ka Pono student in her poem, paraphrasing Mahatma Gandhi. Up next was performer Makana, who played a modified version of his “We Are the Many” anthem advising the crowd to “Occupy GMO.” He also performed a new song titled, “The Story of the GMO,” which addresses the history of the anti-GMO movement and closed the evening with an untitled “Song for Vandana,” that he was inspired to write while listening to Shiva’s presentation. In introducing Dr. Shiva, Redfeather said Dr. Shiva has trained more than 650,000 farmers in India and is advising Bhutan on how to be come the first wholly organic country in the world. “I was told you were a very small island with a very small population. It doesn’t look like it when you stand in this hall,” she said. She said that the myth was that spraying pesticides has lead to the rise of GMOs. She said Bhopal isn’t the only poison tragedy in India. She said 1,000 people died in the past couple years in “the endosulfan tragedy,” when thousands of people were sprayed with pesticides that went into water and wells. Dr. Shiva said India’s Green Revolution started off with chemicals that were designed for killing people in times of war. After World War II, these companies then turned the chemicals into pesticides and now have become a biotech. “The explosive factories were redesigned to create fertilizer,” Dr. Shiva said, noting that the Oklahoma bombing, the Oslo bombing and every bombing in India were created using fertilizer bombs. Her research for the United Nations also uncovered that nerve gas was being modified into modern day pesticides. She addressed her plans to organize new Nuremberg Trials to go after the companies making nerve gas to kill people during World War II that are still making chemicals today. “We are going to organize new Nuremberg trials and bring together everyone that has been harmed in the name of agricultural progress,” she said. Dr. Shiva went on to say she was at a conference where people were talking about making seed saving a crime. She said one of the big fights being faced is to prevent the criminalization of seed saving by farmers. “How could it be that the death industry can recreate itself as the life sciences industry?” she asked, adding that the companies position themselves as patient and diagnostician for a problem, with the problem being farmers saving seeds. She said that growing up, her family used the neem tree for pest control, which causes bugs to reproduce slower. She said the neem tree is called the “village farmer,” and has more than 1,000 uses. She discussed other biopiracy cases such as basmati rice, which RiceTec patented and claimed to have invented along with how worldwide trade impacts the industry. 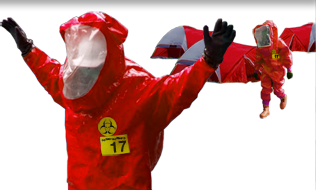 In the end, though, Dr. Shiva said the biotech companies have left us with bug-resistant super pests and super wheats. Monopolies and monocultures go together and have reduced to just eight commodities including animal feed, biofuel and human food last. She said it wastes communities by destroying them and imposes uniformity along with shipping them in trucks. “Food is a waste system. It wastes the Earth, it wastes communities, it wastes potential, they ship it thousands of miles in trucks,” she said. She said people should live by the tenets of Gandhi, including satyagraha meaning fight for truth; swaraj meaning self-organized freedom; and swadeshi, meaning self-making as a rule of freedom; and the concept of lifting up everyone including the most vulnerable. 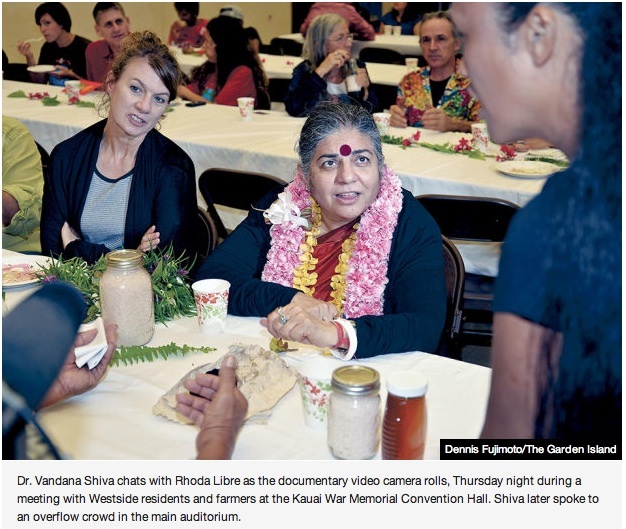 In the end, Dr. Shiva called on Kaua‘i’s residents to work on feeding themselves.